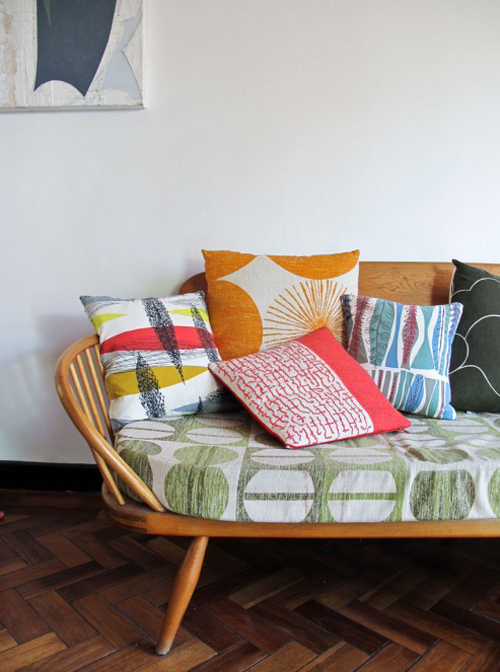 Today I’m loving … this beautiful cushion selection on Heather’s (a.k.a. Skinny laMinx) sofa. From left to right: Vintage fabric cushion from Nice Work; tapestry cushion by Skinny laMinx; vintage orange cushion; vintage Mary White fabric cover by 35 Flowers; vintage fabric cushion. I really love the orange floral graphic cushion. and the chaise/chair that they are all sitting on! ps it looks like a large orange daffodil!